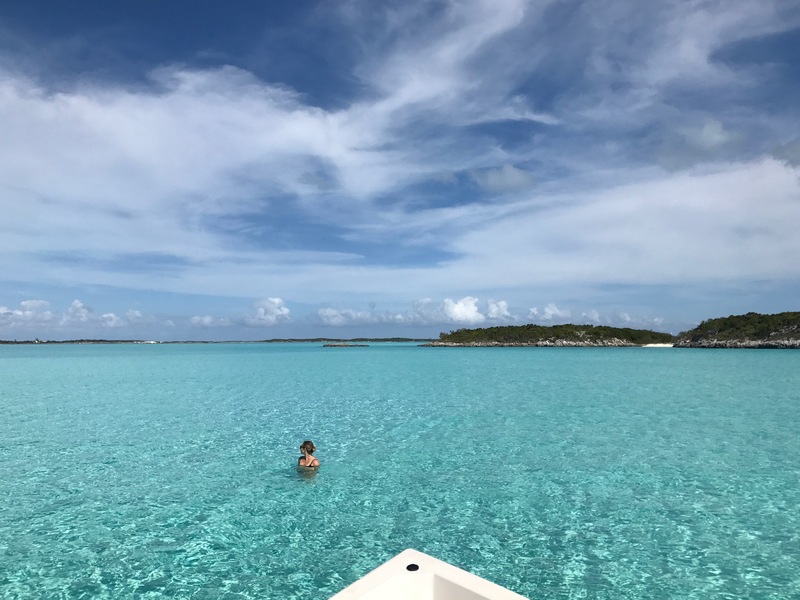 Island Hopping in the Exumas: Staniel Cay Yacht Club - Where to, Peanut? 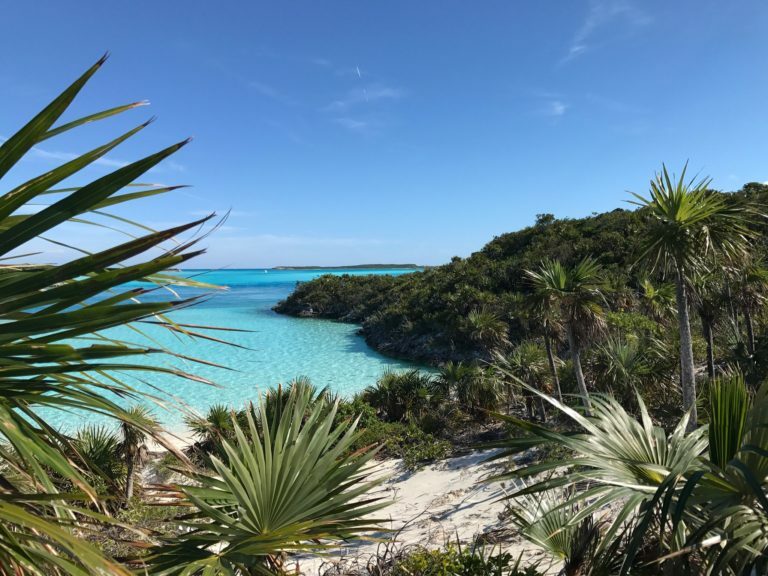 The Exumas, Bahamas were a place that, frankly, seemed too good to be true. 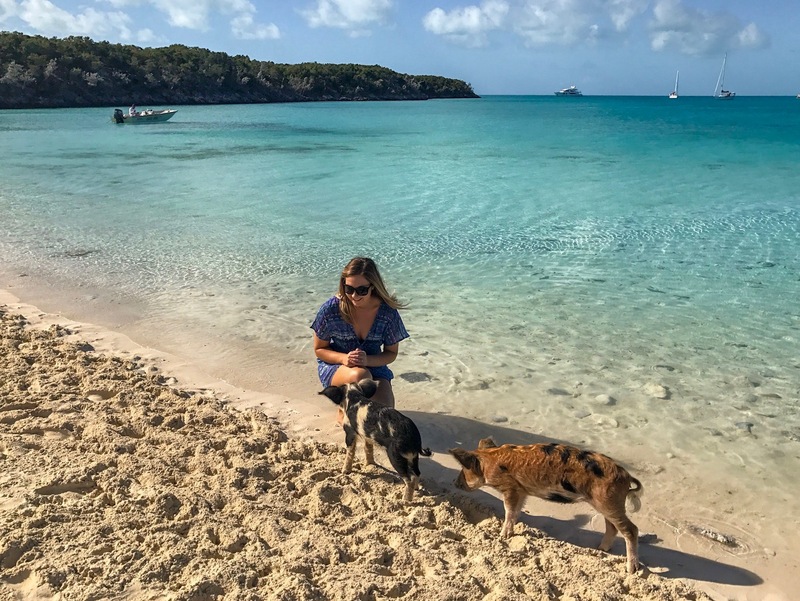 From the almost violently blue waters, to the pigs swimming happily in the Caribbean, I had my mind set that there had to be some degree of overstatement. I was wrong in all the right ways. We flew over on a small plane via Watermakers Air from Fort Lauderdale. As Staniel Cay isn’t an international point of entry into the Bahamas, we landed in a place called Congo Town. In a single room painted canary yellow, our passports were stamped, and we were welcomed into the Bahamas. 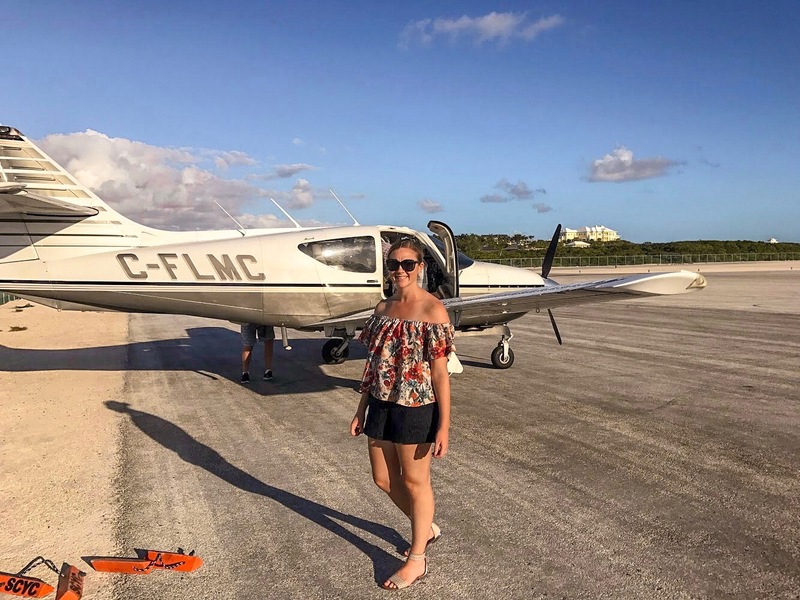 A short hop later, with only my husband and I in the Cessna Caravan, we landed in Staniel Cay, an island in the middle of the Exumas. 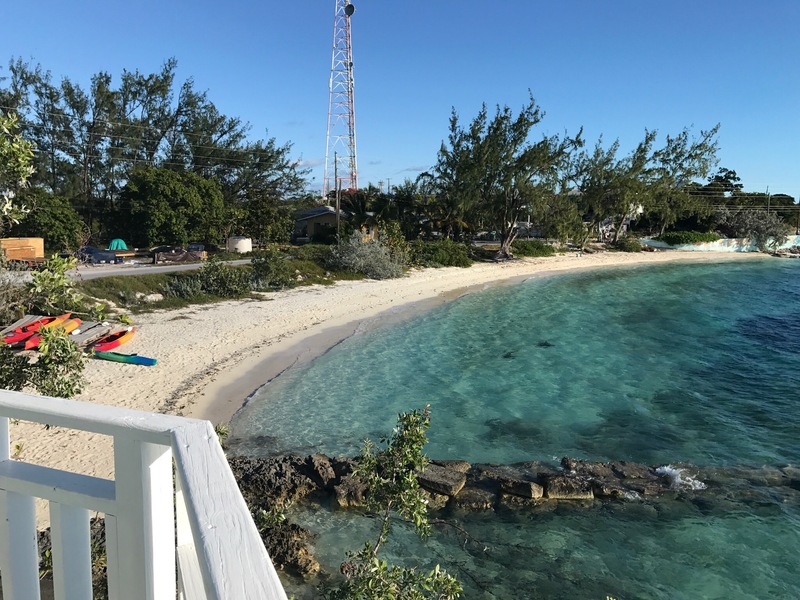 Staniel Cay Yacht Club is the hub of entertainment and accommodation on otherwise sleepy Staniel Cay. The bar is a hodge-podge of flags from the vessels of yachties and sailors who have visited the island before. Old photos grace the walls in which recognizable stars from James Bond 007 share cocktails right where you’re standing. A reggae riff fills the air, and a sea breeze wafts through. The dozen-odd rooms are all free-standing bungalows, and are individually named. We chose the Key Lime, as it was furthest from the restaurant and bar, and featured a two story deck perfect for watching the sunset while playing a game of Yahtzee. The Key Lime was simply appointed in breezy neutrals, and had a winding spiral staircase up to the main bedroom. For seven surreal days, we explored in our little boat. 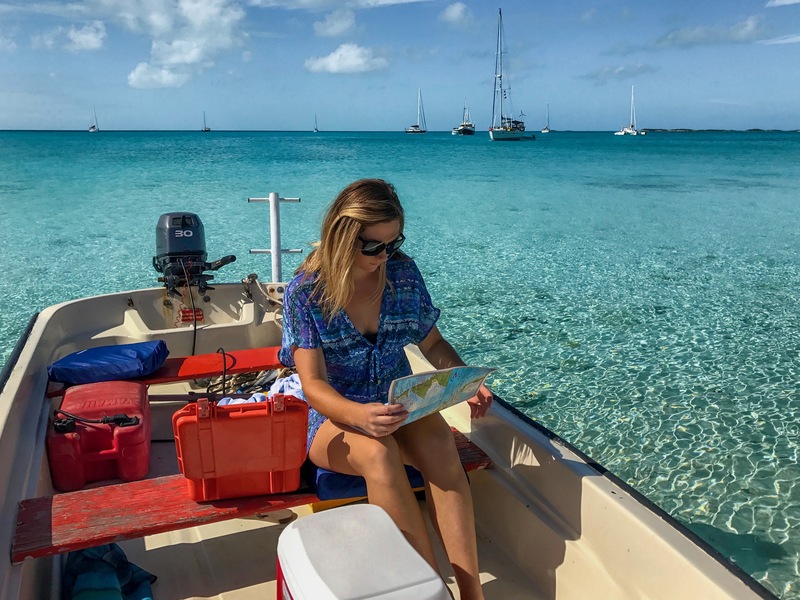 We referred to our map, which I began to call “the chart” and navigated up and down the Exuma Cays with often not a soul in sight. We checked the tides, and made sure our pelican case was locked tight with our radio inside. We picked up our ice chest with our lunch (usually fresh lobster rolls) inside, and set off into the blue. What we discovered was beyond a dream. There are many photos on Social Media and beyond that show pigs swimming in the crystal blue waters of the Bahamas. I am sad to tell you that most of these are tourist traps; pigs put on beaches for the sake of tourists who come in droves. 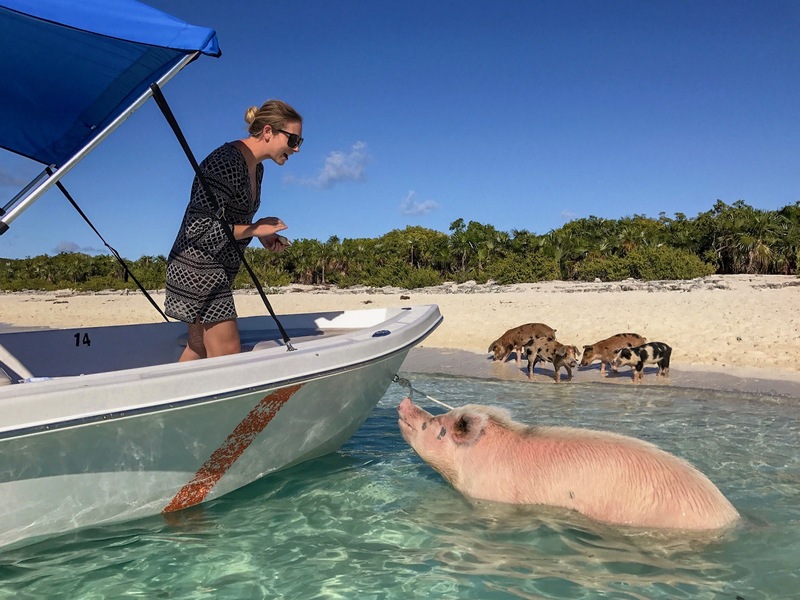 However, Big Major Cay, just a 10 minute boat ride from Staniel Cay in the Exumas is where the legend of the Bahamian swimming pigs began. 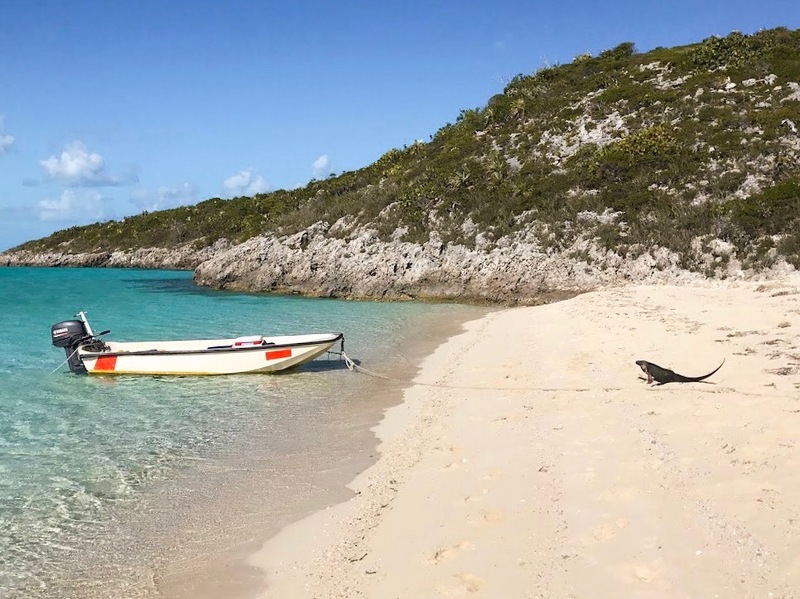 Though you might see a few posh yachts and sailboats in the sheltered bay by the island, you have a decent chance of having the beach and pigs all to yourself. On our way back from exploring, we pulled our boat up every day to say hello the pigs, and to feed them the leftover fruit and bread from our lunch. The pigs who will swim out to your boat, however, are not piglets. They are massive, 300+ pound mama pigs, who are hungry! For this reason, it is recommended that you feed them as you leave to avoid being chased on the beach! The piglets are adorable, though mostly aloof, preferring to dig for and eat sand crabs where the sand meets the water. 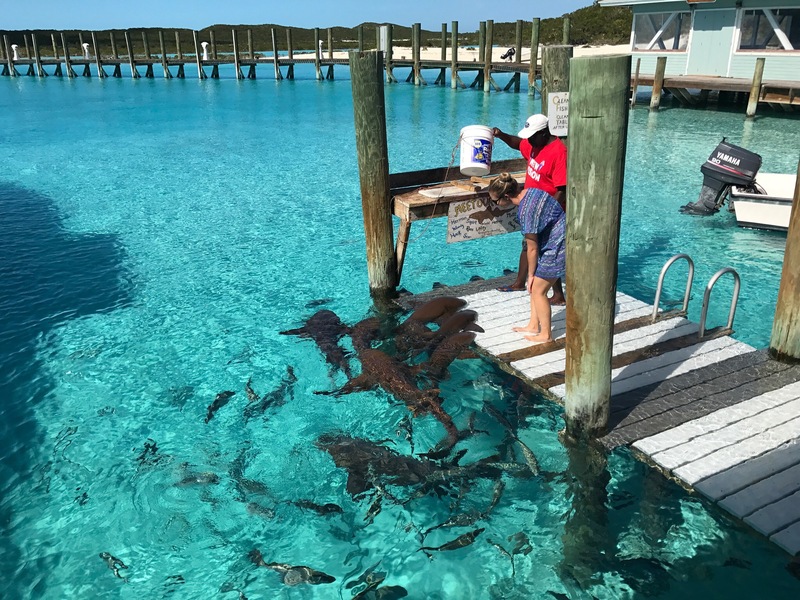 Compass Cay, home to the tame nurse sharks, was a highlight of our explorations. We anchored our miniature boat by a dock meant for mega-yachts, and ascended a ladder up to the dock. 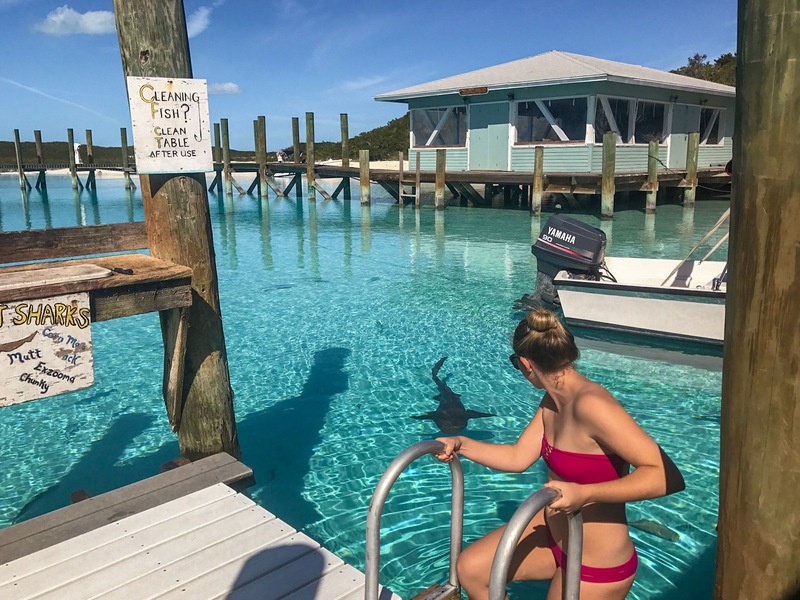 A family was swimming with the sharks when we arrived, but they quickly finished, and we were able to swim with and the nurse sharks with just the purveyor of the island, Tucker, there to supervise. As the tide rose, Tucker showed us how he had trained his “pet” sharks to swim up on the dock for food, and showed us how we could pet them! It felt like a once in a lifetime experience! We walked around the island to the ocean side, where a completely empty white sand beach revealed itself: a site where Corona commercials were filmed, we later found out. Bitter Guana Cay was, where they alleged, the wild iguanas lived. However, when we first pulled up to the beach, all I saw was beautiful white sand. My husband and I fiddled with the anchor, and when we looked back up, there were suddenly dozens of iguanas, several feet long dotted along the beach, staring us down. We heeded the ‘do not feed’ warning, though a woman we met on the island did not — and had the wound to show for it! 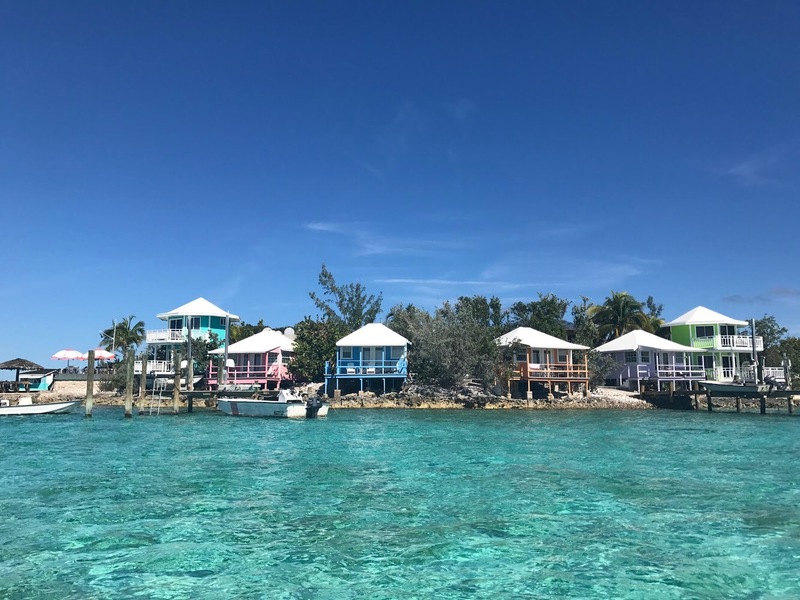 In addition, Thunderball Grotto is visible from Staniel Cay, and just five minutes away, and offers a brilliant underwater world of tropical fish and rays. This was a filming site for 007, and I was so happy to be able to explore it! 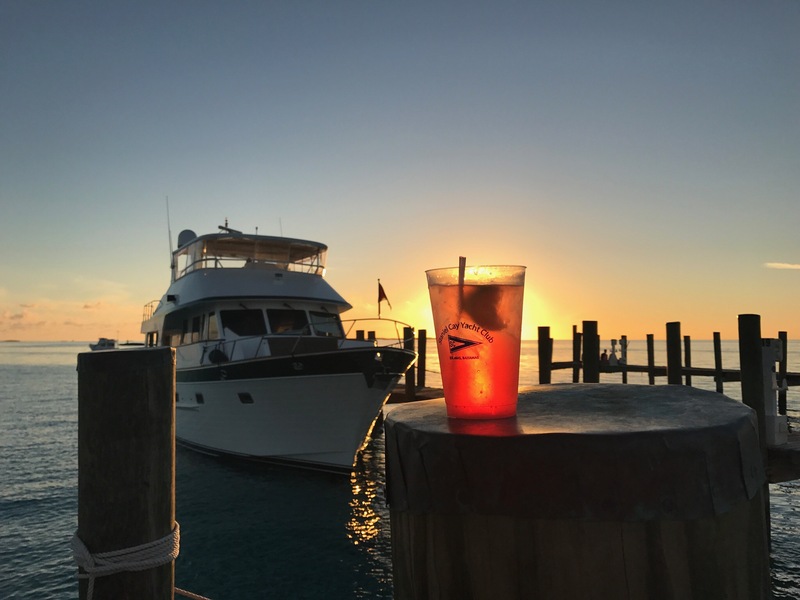 On land, the Staniel Cay Yacht Club offered wonderful meals. Dinner each night was your choice of three courses, mostly seafood. The lobster in particular, was incredible, with the largest lobster tails I’ve ever eaten! It was unimaginably fresh, with your dinner going from ocean to plate in the same day, the fishermen selling the remaining daily catch out on the dock each evening. 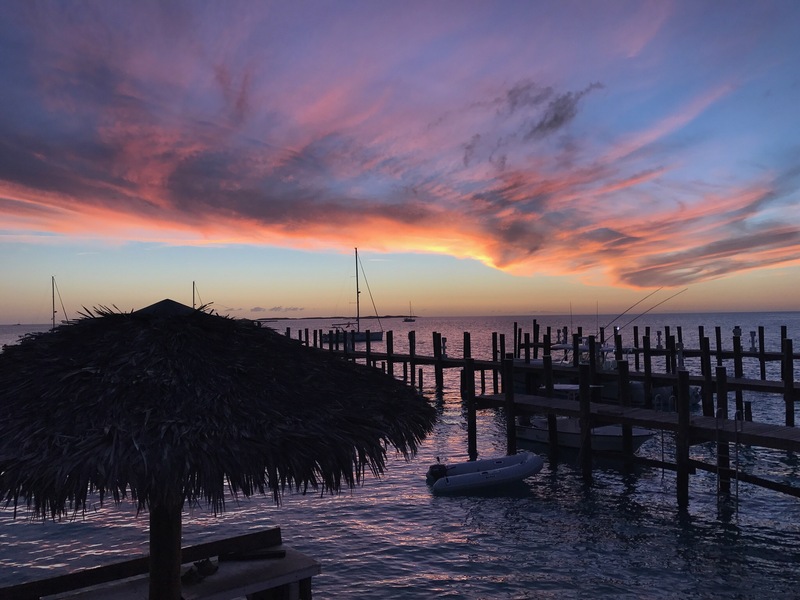 Staniel Cay Yacht Club creates an ambiance in their restaurant with modern island decor, and candle flames flickering in the sea breeze. The bar is a lively atmosphere after dinner, where a varied crowd mingles. 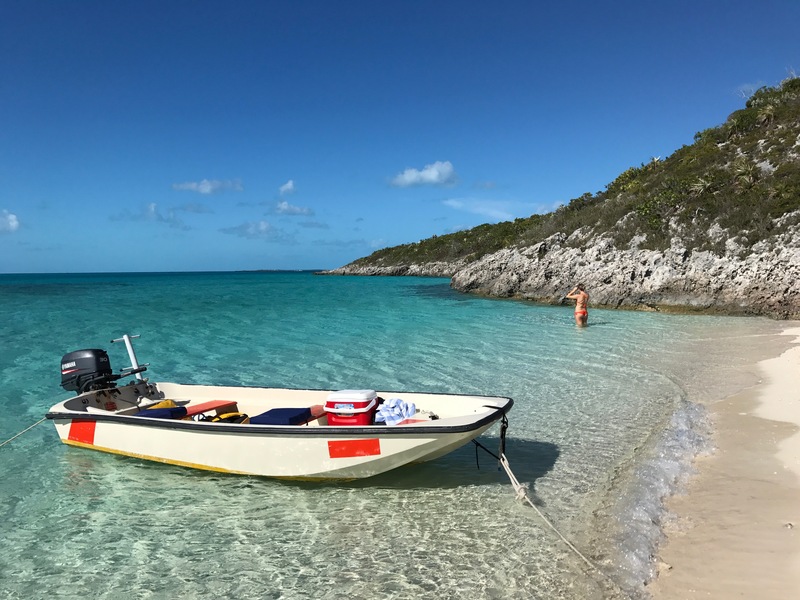 From sailors, to locals, to yachties, and normal vacationing people, everyone swaps their tales of daily exploration and beauty out in the Exumas Cays. Though normally on the quieter side, my husband and I made a whole group of friends while at Staniel! This included a group of Canadian pilots who actually took us up for a ride in their plane to burn off fuel before their departure, and a sweet American midwestern family who we swapped travel tales with nightly. 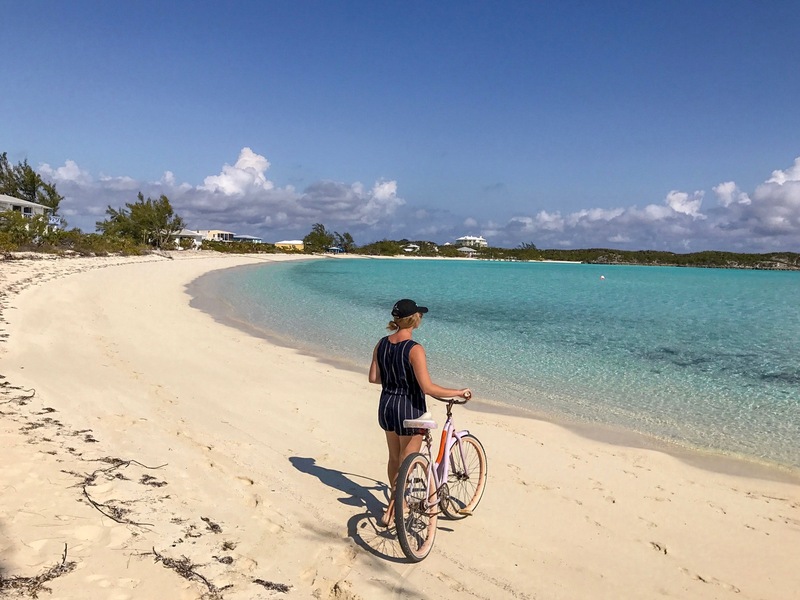 Getting around the island takes but two forms: golf cart or bike! We did not have the former at our disposal, but we did ride perfectly rusty beach cruisers around the small island. I enjoyed hiking on a trail on the spine of the island where you could see the tranquil turquoise of the Caribbean sea contrasted with the deep and churning blues of the Atlantic. I also loved watching the small aircraft taking off from the airstrip on the island! Exploring the Exumas was something out of a dream, but it was also something more. 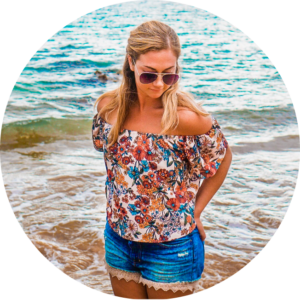 The trip pushed me out of my comfort zone on land, and into a boat out into the sea. The experience had me referencing a tide chart, and a nautical map, and using my own judgement to quite literally go with the tides, and set anchor in places where the current wouldn’t set us adrift. It was challenging, beautiful, and unforgettable. And PS: the water IS really that blue! Most of the photos in this post are unedited or have been slightly desaturated. Honest. This is so amazing! I want to go here and do the same thing one day! Looks like a dream and I love the swimming with the nurse Sharks how cool! Ahh this looks like a dream, truly ? Love your writing style so much! Very informative! 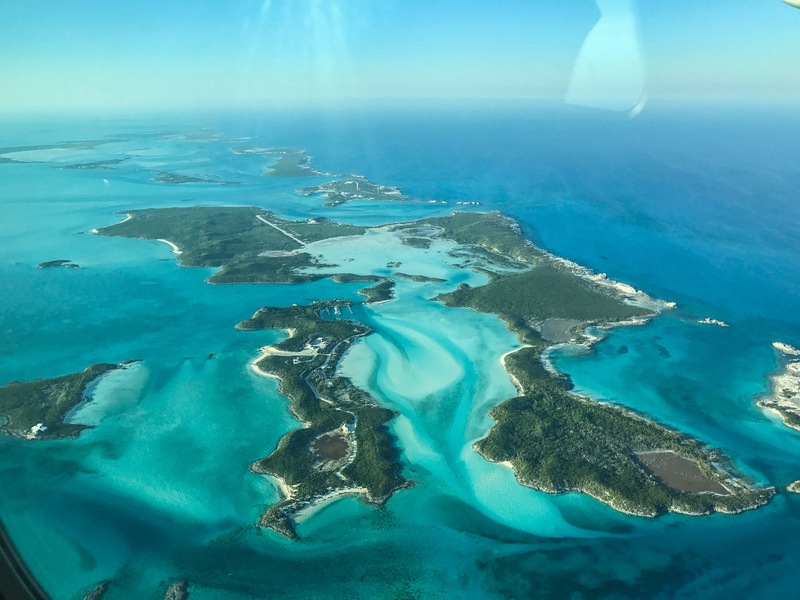 I hope to make a quick trip out to exuma before moving to Washington!